We live in the information age, which means living in the excess information age. And as most of us have come to realize, almost anything can be deemed “bad” for kids by someone somewhere. My favorite example comes from the Julie Gunlock book, “From Cupcakes to Chemicals,” where she writes about listening to the news one night and hearing how dangerous it was for kids to drink from the garden hose. As if this is their sole source of liquid for 18 years. …The night before we left I read an article about a study that had been done about the worst types of sunscreen to use on children and adults. Sure enough, the stuff I just bought a while back was number one and number two. Of course. Of course it is. Do I throw it out and waste the $30, which is no small sum for us? Then go out and buy the good stuff, the lotion made by tiny fairy angels who infuse it with love and eternal life, for the low low price of my left ovary? And, by the by, it’s only available in California, because that’s where the fairy angels live. Or do I go ahead and lather my children up in this toxic death cream because I obviously, according to this article, don’t care about them? I am tired, people. And it’s not just because my husband is working a lot. Or because I have twin toddlers that only function at 0% or 120%. They live on what I like to call, Captain Me Planet. There is zero visibility and they are flying at 100 mph anyways. No big deal. I got this. Isn’t it horrifying that a mom who is simply struggling with the latest worst-first parenting article has to even mention CPS? Why should any decent parent even have this worry on their radar? I am just sick and tired of all the rules. Rules about food. Rules about hygiene. Rules about clothing. Rules about schooling/education. Rules about development. Rules about medication. Rules about sleep methods/co-sleeping. Rules about playtime. Rules about friends. Rules about car seats. Rules about breastfeeding. Rules about child-wearing. Rules about television. Rules about the rules. 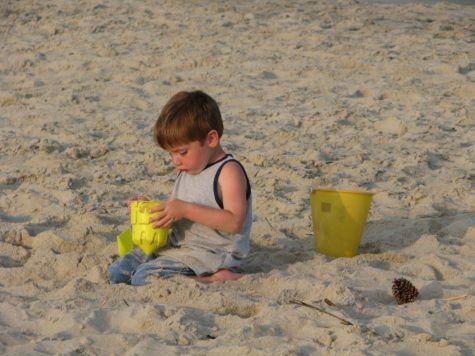 Now that I”m covered in million dollar sunscreen, can I eat this bucket of sand? UPDATE: PARENTS OF GORILLA BOY WILL NOT BE PROSECUTED. Last Zoo Thought: Why Do We Assume There’s ALWAYS Someone to Blame in a Tragedy? Maybe it would help if these articles were written as “some ideas/information just in case you were wondering”. If I’m worried about the chemicals in the sunscreen I put on my kids, I can look it up, and if I’m not worried and just trying to protect them from skin cancer, I should be able to trust that the FDA has done their due diligence and it is safe to use as directed without being made to feel guilty. Instead of being inundated on every side with what we should be doing, how about helpful information that doesn’t make me feel like a horrible parent if I don’t follow it? There are articles that sometimes pop up on my newsfeed that I just ignore because I don’t want to feel that guilt. Maybe someone could come up with a Chrome extension that changes the tone somehow, taking out phrases like “you could be killing your child and not even know it” and the like and just sticking to the information of the article so we’re not shamed/terrified into compliance with something that will likely be refuted within a couple of weeks. It seems as if most of these so-called health articles on diet, nutrition, exercise, etc., etc. debunk conventional wisdom, I think just for sensational sake. I.e., “Throw away your 100 calorie snacks because they’re making you fat!” In actuality 100 calorie snack bags keep me from eating a 15 ounce bag of pretzels and help me to control my “munching”. Or, “Forget eating food under the diet section of most restaurant menus because it will cause you to struggle with your weight all the more!” In actuality, since I enjoy eating out quite frequently on weekends, choosing food under the diet section enabled me to lose 20 lbs. I could go on and on with all this advice nonsense so I take all that with a huge grain of salt! Its all about the money, honey….fear begets profit. The more you can convince folks they need what you are selling or something bad will happen….even just a book listing off those bad things, well that equals money in the bank. Fear is big business. Frankly, the idea of smearing a chemical laden substance all over my kids (or myself) then putting us all out in the sun to bake it right in?? No thanks….Ive never used sunscreen and I dont put it on my kids. Ever. Please stop blaming scientists for mis-information. Science isn’t “changing it’s mind” every Tuesday, it’s media that overstates what a study is saying, or it’s a pseudo science web site that has a panic attack because “all natural is better”. The ewg.org site is a notorious “the sky is falling” site that uses no scientific information at all, but their claims are picked up by every news outlet. Here’s a link to how horrifically wrong ewg.org is, who are the latest scare mongers about sunscreen. John, I agree. I used to be morbidly obese, but I was able to turn it around by exercising and eating a healthier diet, and one of the biggest things that helped me was just making small changes, like switching to diet pop instead of regular…….and now there's all this sensationalist hoopla about how artificial sweeteners are going to kill us. Honestly, I don't think I would have been able to lose weight and get healthy if it meant living a life with no pop at all. Just to follow-up with my post, a most recent health article I was reading condemned carbonated water such as Perrier water and LaCrois, which I drink all the time (because drinking water is healthy for you), as unhealthy for your teeth, particularly the flavored carbonated waters. It said that persistent consumption of carbonated water will cause your teeth to rot. I have been drinking Perrier and LaCrois for years and years and years because for me anyways, these type of beverages make consuming water more palatable and tolerable compared to the conventional out of the faucet stuff. I also have not had a cavity in 20 years and my kidneys are in great shape! My teeth are also whiter than average. Probably because I brush my teeth on a regular basis? I mean, won’t the consumption of steamed vegetables also cause your teeth to rot IF you never brush them? That’s right folks, drinking lots of water is not sufficient enough unless we’re miserable drinking it! Actually Emily, you will be pleased to know that the dangers of aspartame have been found by science to be a myth. There is absolutely no evidence that claims aspartame will give you cancer. Now if you drink 64 cans of diet Pepsi per day for 20 or more years straight, that MIGHT be a problem, MIGHT. But 99.99% of the time, diet beverages will NOT kill you! Yet, this myth is perpetuated by the uninformed public to the point where even Coke (or is it Pepsi?) is no longer producing their diet beverages with aspartame. Now there have been credible studies that found diet beverages MIGHT affect your metabolism to the point where it gives you the munchies which could cause weight gain. But even that does not affect everybody. I’d say if consuming diet beverages are enabling you to lose weight, there is no need for you to quit drinking diet beverages! At the pool now and just listened to a mom lecturing her kids about how sunscreen can disrupt growth, is filled with all kinds of horrible chemicals, etc. Really, she wasn’t lecturing her kids so much as itching for a fight with a nearby mom who sprayed sunscreen on her own kid’s face. The problem with these scary sounding articles is how many people use them to loudly criticize other people’s parenting choices. I know I took a good look at her so I could be sure to stay far away once we got into the pool. Why use sunscreen at all then? Isn’t the whole skin cancer scare nothing but fear-mongering hysteria, created to judge us and make us feel guilty? After all, our parents/grandparents etc. didn’t use sun-screen and they were just fine. They just want to sell us stuff. Speaking of which, do you know what is the most important thing to sun-screen companies? Profit. Not your child’s health. So I’m glad somebody went through the trouble of looking into sun-screen toxicity and shared that information with me. I’m going to use it to my advantage, not be annoyed about it. Free range parenting is about raising our children to be independent and self-sufficient and giving them plenty of opportunities and space to practice these skills. I don’t see how having access to information about how unscrupulous companies can profit at the expense of our and our children’s health (among other things) stands in the way of that. People who live in fear of being judged have a problem. I make my decisions based on what’s best for my family, not what someone else might think. I borrowed this sunscreen from a friend on my last trip to the beach and got scorched like a ginger lobster. Pretty sure it was SPF Unicorn Farts and made by an *honest* Hollywood mom…and it didn’t work like my chemical death sunscreen. Using a chemical protection (vs. physical like sun shirts and spf hats, which I prefer) is really a crap shoot. I personally find the natural ones to sting my kid’s eyes and not be as effective as the old standby- no ad sunscreen. 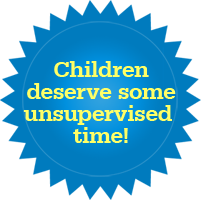 I get no complaints from the kids and that makes them more likely to use it routinely. Sunscreening kids is a special circle of hell…they hate it, we hate it, and now we are apparently marinating them with chemical death anyway. Vitamin D and sunshine are good for kids in moderate doses! I just ran out at lunch time to our dairy to get supplies to make homemade ice cream (because we like to tempt our obesity odds with full fat dairy) and stopped at an organic farm- they had PYO strawberries. I’ve always gone with my kids when they were little and the farmers joked that we lost money with kids like mine who taste tested fresh strawberries from the vine to identify the sweetest ones. They are a local CSA and want kids in the fields and in the dirt eating fresh from the plant produce! So I picked a flat (it was a beautiful day and the strawberries are candy sweet) and noticed a small boy picking (and wanting to taste) and then heard the mom yell, “Jacob!!!! Don’t eat them! They are DIRTY! Mommy needs to clean them first!” Jacob really wanted to eat a strawberry. I was eating strawberries and I may or not have taunting him into eating a strawberry away from his mom’s dirt-patrol. Then this mom started freaking out about the bees. “Watch out for the bees, Jacob!! Jacob??!!! It’s right by your head! !” This is a farm. The bees pollinate the plants. Bees are good, unless you are allergic. So few more minutes of the bee paranoia and I asked the mom if was allergic and she said no, he’s just really, really scared of bees. Wonder where he gets that from? I worry more that Jacob is going to need a psychiatric medication to get through his fraught youth than what chemical-of-the-day-to-bash of dirt on an organic strawberry is bad for your kid. Well, I don’t think a sunburn is good for ANYBODY let alone a kid. At age 60 I just had a basal carcinoma removed from my right shoulder and I don’t think it’ll be the last. That could be attributed to the fact that I’m of fair complexion and used to be a lifeguard back when I was age 19 thru 25 and received numerous sunburns because I was too stubborn to put on sunscreen because I was convinced I was gonna get as brown as a person from central India! Perhaps allow your child a few minutes in the sun without sunscreen which would allow his body to produce vitamin D, but after that, I’d cream him up with it and I wouldn’t be picky about the brand. Just so it has a high SPF value. You know what other warning I am so completely SICK of? The “brain drain” and Summer Slide that reverts our kids back to drooling idiots because they aren’t in Kumon. The only slide I want my kids to concern themselves with is a water slide. Maybe even a slip and slide or one of those homemade fun ones with a tarp, dish soap, and a hose. Maybe I’ll teach them the electric slide?! Recreational reading is a good learning habit, but putting them on development and reading goals for their vacation? Let them slide. I don’t give a crap. This mom is tired. I am not filling out one more f*in reading log that forces me to lie and tracking this nonsense! One thing that helps is to stay off the internet. (I’m totally aware of the irony of saying that in the comment section of a parenting blog!). But all this scare-mongering and judging of parents seems to mostly exist online and, to a lesser extent, on tv. When I am with actual parents, doing actual things with our actual kids, most people seem pretty normal. Reasonable, non-judgy. And I spent 2 years of my son’s life in Manhattan, which is supposedly the epicenter for crazy judgemental helicoptering. I mean, we all do have that one parent in our social circle who is terrified of everything, but they were around when I was a child, too. They just didn’t blog about it. I’ve worked in publishing and many current advertisers want “relevant content” for their ads. There’s a big pay to play going on with regards to what types of articles get published for digital and print. An article about harsh chemicals in sunscreens usually has an adjacent ad placement of an all-natural sunscreen that is paying for placement and article. Educational advocacy, sponsored content, all euphemisms for articles that exist to meet the needs of the company advertising a product they want to sell to you. I get my product recommendations the old fashioned way- I ask my friends and fellow parents I trust. @John and Emily, the one I love is “don’t drink diet soda because it triggers your sweet tooth and causes you to crave suar and eat more.” Well, it doesn’t if you’re being conscious about your food intake, and if you don’t feel you have to give in to every single craving!!! I recognize that there are other issues with diet soda, and I don’t drink it myself (but I do drink flavored water OH NO), but this was one of the first messages trying to make people fearful about it. A bit tangentially, it reminds me of how my daughter’s environmental science class had a project where people were supposed to make personal care products using “natural” ingredients. She brought home a little container of bug repellent that was somebody’s project. I tried it once, on the theory that where we were going wasn’t terribly bug-infested and didn’t have any particularly scary bugs. Folks, if you want to protection from natural stuff, you need to use unnatural stuff. Because protecting yourself from the natural world ISN’T NATURAL but it is often necessary. @Lollipoplover–I just read that article, and there’s no mention of reading logs; it just says to read to your kids, and encourage reading, at times when you might be reading already, like reading the newspaper at breakfast, reading stories to younger kids at bedtime (and encouraging older kids to read on their own), maybe packing a book or two to read during quiet times at the cottage (no WiFi, and surely it rains there sometimes, and sometimes it’s nice to read on the dock while taking a break from swimming). I actually think that that’s good advice. I mean, by encouraging (and modelling) this kind of reading, and allowing kids to pick what they want to read, you’re showing them that reading can be fun, even (or especially) when you don’t get graded on it. P.S., Lollipoplover, just so we’re clear, I don’t agree with giving kids summer “homework” (Kumon, worksheets printed from the Internet, et cetera); but I don’t think “encourage your kids to read” is overkill. After all, even reading Archie comics counts as reading. @Emily – I just read that article, too. Of course it assumes that a parent is actually concerned that their child is struggling with reading, and that they believe that something can be done about it (and should be done). If one has adopted a fatalistic attitude about such things, then it’s easy to not worry if one’s kid can read or not. Hey, summer vacation is for parents, too! I just had a raging fight with a person I consider a dear friend over this – she took the article LITERALLY, as in it’s only about the sunscreen and how could you not want to protect kids from reproductive issues and childhood cancer and whatever else it is…. I didn’t know how else to make clear it’s not JUST that, it’s the *everything* being wrong. The paper plates and the chicken nuggets and the red dye #5 popsicles and the toxic death cream. She just replied that when you know better you do better, would this mom be writing a ranty article about not bothering with stinking carseats or how it’s no big deal to smoke up the car with the kids in the backseat, etc…. @Jason–I see your point about the “struggling with reading” part of the equation. I might have missed that, or written it off as “background noise,” but now I think it’s important. I think there’s a difference between encouraging ALL kids to read, and encouraging those who struggle with reading, to read. I never had a problem with reading as a kid (in fact, my parents sometimes had the opposite problem with me; I’d stay up late and read and not get enough sleep, or I’d want to read to the exclusion of outdoor play), but singling just one child out for mandatory ANYTHING, is a great way to make that kid hate whatever the mandatory activity is. I mean, sometimes, this can’t be avoided; like if one child has to study for a test for school, or one child needs braces or glasses, and the other one doesn’t, but with reading, it’s so easy to just keep books around the house, or say, “Today, we’re all going to the library,” or to tuck a Chapters gift certificate into a birthday card or Christmas stocking in addition to the child’s main gift. I was “singled out” as a child for other reasons–I was overweight, so my parents would put me on diets, but not my brother, because he wasn’t overweight, or my dad would force me to practice math with him (beyond the crap-ton of math homework I’d get in high school) because I wasn’t good at math, but not my brother, because he was younger and therefore doing easier math in school. The reverse happened sometimes too–my brother was very ill as an infant and toddler, and was repeatedly hospitalized for hernia operations and croup, while I had no such problems, and he later needed braces, while I didn’t, and he had to be goaded into swimming lessons and music practice, while I did both willingly. But, I get it–there’s a BIG difference between “Let’s all go to the library!”; and “Sam, you HAVE to read for 20 minutes before going outside to play with Sarah.” Also, every kid is different–you could have two kids in the same family, and for one child, you might say, “Sam, if you finish a whole book by the time school lets out, we’ll buy you a pass to the community pool so you can go swimming whenever you want”; while to the other child, it might be, “Sarah, if you earn your swimming badge, we’ll take you to the bookstore and let you pick out the book of your choice.” To me, both reading and swimming are innocuous, positive activities, but that’s not the case for everyone, and attaching a “must” to a disliked activity (regardless of what that activity is) can make it worse for someone, especially a child. If I manufactured ABC Sunscreen and my competitor is XYZ Sunscreen then I will tell everybody that XYZ Sunscreen is made from recycled mustard gas from WW1. I will also say that ABC Sunscreen is so wonderful that is also makes your farts smell like roses! If we only focus on morals (or lack of) then nothing will change. We also need to look at the gullibility of people. I bought passes to the nearby water park on the suggestion of my SiL who was practically raised by the water park. Took my girls there, held the baby, let the 3-year-old run around with strange kids. I did not put sunscreen on them. I like sunscreen well enough, but, well, I had left the bottle in my husband’s car and I didn’t want to pay for more and my girls’ skin apparently comes from the Native American genetic strain on their dad’s side. We survived. Oh, and another mom helped my daughter up when she fell down in the kiddie pool (big whoop) and I thanked that mother and she said of course and it was just a lovely sense of community. As for summer reading… I’m a teacher. I’m not doing a darn thing concerning education that isn’t adding to my TeachersPayTeachers shop for spending money and no, I don’t expect a single student to spend his summer doing random worksheet crap. Anne, I agree with your friend (you can probably tell from my previous comment). The author wasn’t exactly talking figuratively, she seems both too lazy to comb through “too much information” for the stuff that matters and too worried about what the rest of the “parenting world” will think of her. That is really interesting, about the relationship between the ads and the content. Right. When I need professional child rearing advice, the first person I think of is that drooling idiot on my immediate left. When it comes to parenting, I have adopted what I call the “strong atheist” position: I don’t know with absolute certainty how to make my children safe, comfortable, and fulfilled AND YOU DON’T EITHER! I stand with Sara, and Lenore, and all the other real parents who would rather raise children than play-act at raising children for the approval of the madding crowd. So stop getting all up in my face with some stupid rule you never even heard of until you read it on the internet five minutes ago. And wipe that drool off your chin. What? No kids riding in the open bed of a pickup truck? What kind of 70s is this? I brought up reading logs as my own personal rant. I am so entirely sick of them and lie on them regularly. Not that my children don’t read. 2 out of 3 are avid readers. The boy would rather have a dental procedure than read a book for leisure, but enjoys hobby books like how to make your own fishing lures and other outdoorsy crafts. He has assigned reading for the summer…and knowing him, he will wait until right before school to read those books and I’m fine with that. As Jason said, it’s this fatalistic view that a struggling reader needs to have a plan of action and can’t get a break. I think they need the break (and summer adventures provide good sources of writing topics for next year)! Why is she reading these articles to begin with? To Anne, Anna, whoever….the writer isn’t saying she doesn’t want to use sunscreen. She wants to use the sunscreen she already bought and paid for (and probably not of dubious quality bought from street-corner sunscreen hustlers), without having to extensively research what horrible effects this sunscreen will have on her children, then research whether or not her first research has any credibility and is peer-reviewed, and then more research because that’s apparently what moms are supposed to do. If that’s how you do it, then it’s the right choice for you. It’s not the right choice for others. Lollipoplover, that totally counts as "reading a book for leisure." In fact, if your son can read a craft tutorial, then make the craft in the tutorial, that shows that his reading comprehension is just fine. Maybe the school doesn't see it that way, but I agree; you shouldn't worry about him growing up illiterate because he doesn't like to read stories. First, the EWG hates spray-on sunscreens, because of the inhalation hazards as well as the possibility one may miss a spot or apply too little. Well, yes, that is possibility. Much like it’s possible to miss a spot because my six year old is trying to run towards the water and not stand still so I can properly apply the lotion-style sunscreen. And of course there is no inhalation hazard of, say, the water at the beach. Trust me, your precious snowflake is not going to get high from a whiff of propellant from the spray-on sunscreen. Then, they are not happy that oxybenzone is an active ingredient in many sunscreens because it penetrates the skin, acts like estrogen, can trigger allergic reactions, and there are inconclusive studies that link high concentrations to health disorders. Of course, the American Academy of Dermatology still recommends the ingredient because our skin is actually really good at keeping stuff OUT of our body. And yes, high concentrations of almost anything can lead to health problems. You will die if you breathe too much oxygen, you will die if you drink too much water, and we really like gravity until we start falling out of an airplane. Retinyl palmitate is another “dangerous chemical” that “may speed the development of skin tumors and legions, according to government studies.” Of course, there’s that pesky “may” in the quote that kinda makes the whole thing smell of the stuff that’s usually found in a baby’s diaper. Retinyl palmitate is bascially vitamin A (retinol) reacted with palm oil. I don’t know why it’s added to sunscreen (I would guess that it’s better to have the sun degrade the retinyl palmitate rather than the photo-sensitive chemicals in your skin, but I’m not expert), but again there are plenty of actual real scientists who say retinyl palmitate is just fine. The EWG did happen to put out this big report, along with a request for donations, so there’s that. Nothing helps get the money flowing in like saying “OH MY GOD WE’RE ALL GOING TO DIE.” At the bottom of the page there’s this little sentence: “The ratings reflect potential health hazards but do not account for the level of exposure or individual susceptibility, factors which determine actual health risks, if any.” For the uninitiated, it means that “we dosed lab rats with the equivalent of 8000% of the exposure a human might get in a lifetime, and it turns out the rats died.” Except, being an environmentally-friendly group, they couldn’t use real rats, so they probably settled for the fake rubber kind and were shocked (shocked!) to discover none of those rats had a pulse at the end of the study. We stay out of peak sun, wear sunglasses and sunhats and practically bathe in sunscreen. We are pasty pale and l get to see a dermatologist at a major cancer center regularly because l have skin cancer. It can be fixed but if l can give my kids better odds of never having carcinoma why wouldn’t I? Bring on the chemicals. Some people think we are silly but trust me, even minor skin cancer isn’t fun and the natural sunscreen people tend to not have anything to say after that. Here in Ireland, it is overcast and raining 90% of the time. Sun usually strikes by suprise, when we are on an outing, having packed up the raingear and woolly hats. In this case, I would go to the nearest petrol station and buy whatever sunscrean they have, being aware that it is not the super-duper-organic brand (though I’d like to invest in that, but I’m just not organised enough for it). It won’t kill and it is certainly better than wearing no sunscrean. Great point. Too many unknowns, so many rules. As a pediatrician, I tend to worry about absorption / toxins. I read “Oxybenzone is 90% absorbed” and I wonder if oxybenzone will be harmful to the developing baby brain. But, yet, your picture speaks volumes – our children get exposure to a lot of elements, chemicals, etc and do just fine. Why not a little immune system building?